You have probably done bilinear interpolation in a quadrilateral more than once already. Say you have a random quadrilateral with vertices A, B, C and D, in any number of dimensions. 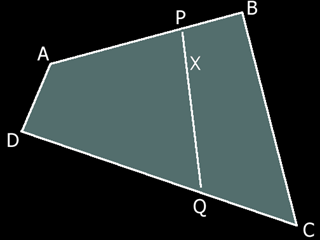 Then any point X inside the quadrilateral can be defined by a couple of coordinates u and v such that the first interpolates across any two opposite edges of the quad to produce two points P and Q, and such that the second one linearly interpolates again across the line that joins P and Q. The nice thing is that the same rules that are used to arrive to X can be used for the any data stored in the vertices (say, texture coordinates or colors) so that one gets the bilinearly interpolated data values at the point X.
with u and v running in the [0..1] interval obviously. So far so good. This is old news, really. However, what happens if we now had our quad, we knew the point X and wanted to extract what are the bilinear parameters u and v? Well, the easy answer is that we simply have to solve this equation and isolate our parameters u and v. "One equation and two unknowns! ", you might protest. Remember that the equation above actually applies to all the coordinates of the system, meaning that the vertices A to D are in fact pairs or triplets of numbers (or vectors in general), so in fact we have lots of equations, as many as dimensions we are working on, for only two unknowns. So the systems is very solvable, and the easy answer happens to be the right one. The discriminant k1²-4·k0·k2 is always positive if X is inside the quadrilateral ABCD. Then, one has to take the positive or negative square root such that v is in the interval [0..1]. Once we have v, u can be computed with the expression used in the first variable isolation step.